Thank YOU for all the sweet birthday messages! I had a great day and am not the least bit bummed to be another year older. I have a great life and I love every second of it :) Here's a pic of me before I devoured my cake. It was delish! Happy, happy 8th Birthday, Murray!! You've got cats that run by your bedroom? We're forever trying to get the cats that come in our front garden. Hope you can get one. That cake looks yummy...have a couple pieces for us. Oh, lookie at that cake!!!!! You knows what I gots for my BDay?? Nothin'. That's right ~ nothin'. You ARE one lucky doggie!!! Can I comes live with you??? RM: Ruby is lying. She got lots of toys and balls and chewies for her Birthday. 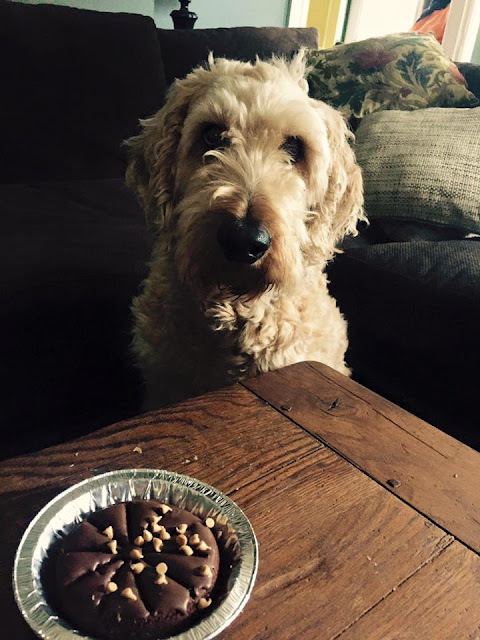 Okay, so she didn't get a DELISH looking cake like yours Murray, but don't let her tell fibs! Whatevers....Happy Happy Happy Burthday Murray!!!! That cake does look delish! What a nummy cake! I'm glad you had a grreat day! We're sorry we missed your glorious day :-( We hope it was a wonderful one and should have been with that awesome cake.